Ebay is offering a flat $10 off $50 on all video games today with promo code CPLAY10. 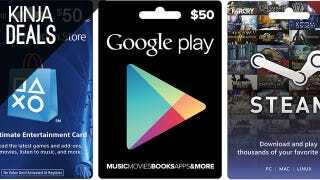 We've listed some of the highlights below, including gift cards to various game and app stores. Seeing a discount on Google Play credit is something akin to spotting a unicorn at the end of a rainbow under a blue moon, so anyone with an Android device should jump on that immediately.